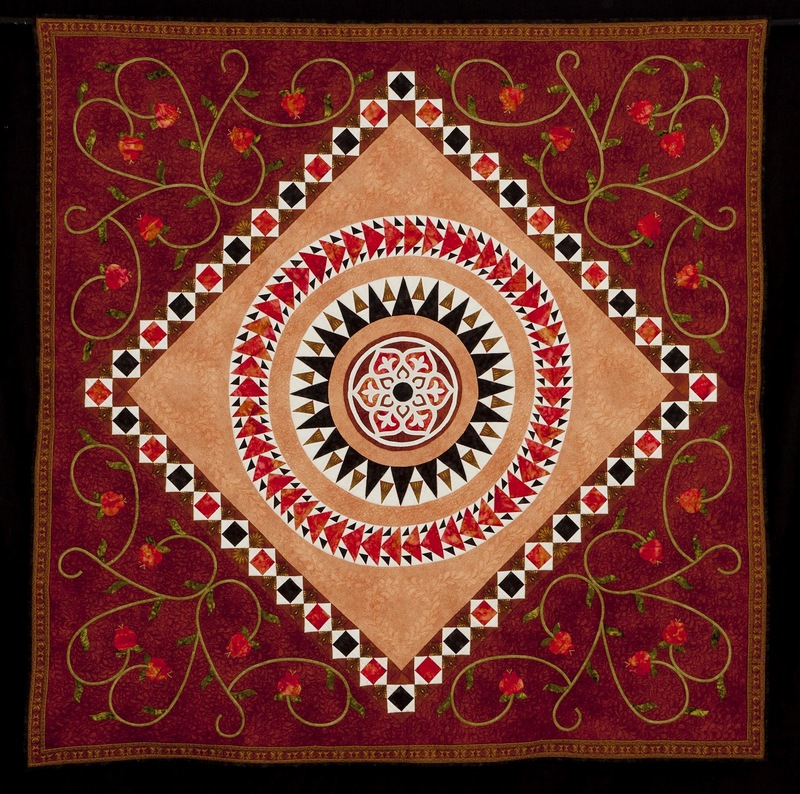 This is sure to be a visual delight for all quilt lovers with over 200 quilts on display. In two weeks time the Judging of this year's Sydney Quilt Show entries will be 'done and dusted' and volunteers will be busy in the Darling Harbour Exhibition Centre displaying the more than 360 quilts entered. We especially need assistance to help with 'take down' duty. Come along and join in the fun, meet other members of the Guild and receive your 2012 Volunteers Badge and complimentary Quilt Show Catalogue. with your "Drop off Lady"? Quilts must be delivered to your contact person by Wednesday, 6 June. Don't forget to check now that your quilt is correctly labelled and has a hanging sleeve/velcro strip (as applicable). Please ensure that there aren't any forgotten pins or needles still poking through. Have you purchased your entry tickets to this year's exhibition at Darling Harbour? If not, there are still a few days left to contact The Guild Office to purchase tickets at a reduced rate. Quilt groups might like to organise a bulk order for their members. Once again the talented Guild quilters who sew tirelessly for this worthy cause invite you to share a few hours with them, hand appliqueing and piecing donated fabrics into special quilts for needy children. Please bring along your favourite sewing kit and either your own lunch, or visit the welcoming cafe downstairs. The 'cuppa' and friendly chat are free! 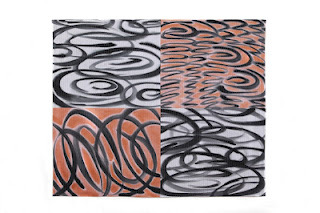 As outlined in The Template (February and May editions), a 30th Anniversary coverlet will be constructed from 1/2 square triangle blocks that have been made by members with their signature on one half. Plain blocks are also requested so that visitors to The Sydney Quilt Show 2012 can add their names. A small sample above shows the variety of fabrics being used, with a cream /off white triangle for a visitors signature. Please use a permanent ink pen, or embroidery to add your own name, and also check that the finished size of each block (once sewn into the coverlet) will be 4 inches. Blocks will need to arrive in The Guild Office before 1 June or be delivered in person to the Guild Desk at The 2012 Sydney Quilt Show. You are invited to take part in Quilting posterity! Tickets are still available in the Guild office if you require some extra...it isnt too late to purchase at the office. 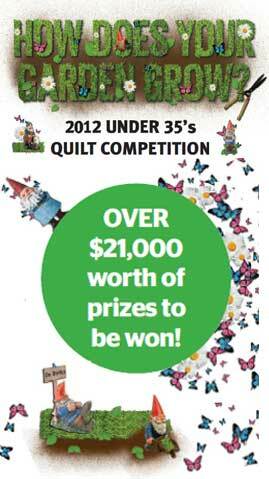 The fantastic 2012 Prizes are..
Design by Nora McMeeking "Belle Belle Quilts" C&T Publishing 2005. 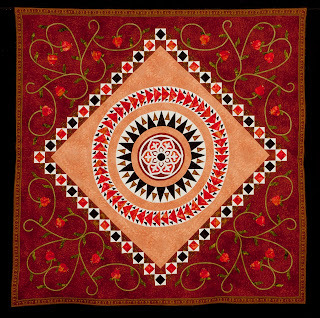 Permission received From Nora www.bellaquilts.com to use the cover quilt design "Cosmati Rings 11"
The Crescent Head Quilters and Clyde Street Quilters invite you to their forthcoming Exhibition. There will be quilts on display as well as handmade quilts and craft goods for sale. Come and shop from several Merchant Stalls whilst enjoying delicious refreshments supplied by the clever quilters from this region. Raffle proceeds will benefit Kempsey Hospice. The Quilt show will coincide with the Malibu Surfing Competition at Crescent Head. To celebrate the 30th Anniversary of The NSW Quilter's Guild a commemorative label has been produced. All 2012 exhibitors have been provided with a complimentary label to attach to their quilts for this exhibition. Further labels can be purchased for $2 each at the Guild Office, during the Burwood General Meeting this Saturday and at The Sydney Quilt Show in June. If ordering through the office, a maximum of 10 labels can be posted in a standard envelope. A postage and handling fee of $1.00 will apply, and if using a credit card, a further $1.50 credit card fee should be included. These white cotton labels are approx 12cm x 10cm with the black lower wording..
"There's nothing black and white about the Guild "
Please contact The Guild Office if further information is required. This is a free exhibition that will be on view until 4 June, showcasing the Contemporary Art Quilts being created by members of the NSW Quilters' Guild as well as those from interstate textile artists. Whilst finished works are highlighted, there will also be the artist's creative journey, for viewers to explore. One of the delights of this exhibition will be the complementary inclusion of individual display boxes, creating an added visual explanation of the processes and inspiration that each of these textile artists were challenged by. If you have often wondered "where did they come up with that?" then this holistic display will help viewers see how and why artworks are envisaged in their embryonic form and then created. Floor talks by some of the exhibiting artists will be held on Sunday 13 May at 3pm and these will further the viewers knowledge of process and product. Special Exhibition Tours are also being held, scheduled for Sunday 27 May and Sunday 3 June. This exciting collaboration between The Quilters' Guild Of NSW and Manly Art Gallery and Museum has resulted from the desire to have a specially themed, curated and specific outcome exhibition, creating a challenge for any quilt and textile artist. Those who have been curated in to this exhibition have been working extremely hard to create their best work. The theme of "Regeneration" is explored with varying fascinating responses, all works excelling in their attention to detail and effect and using a variety of techniques. This promises to be a visually and intellectually creative adventure for all those who visit! This venue is 4 minutes from Manly Wharf and Bus Interchange and close to cafes and shopping. The Quilter's Guild of NSW and Manly Art Gallery and Museum are once again extremely grateful for, and thank Brother International (Australia) for their ongoing support of this unique exhibition. 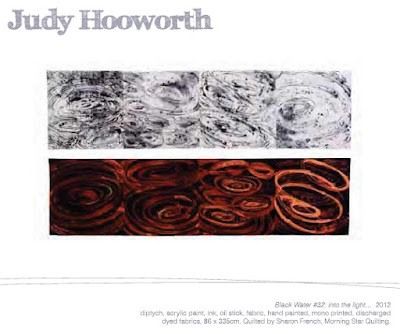 Judy Hooworth, the 2012 winner of the Rajah Award, will give an illustrated talk about the history of quilt art in Australia from her perspective: and specifically how her own work developed and evolved and continues to evolve today. Judy will look at how The New Quilt has changed and how it has influenced her work and the work of fellow artists. Join us in the Charles Kerry Meeting Room on level 5 at The Powerhouse Museum in Sydney at 2pm on Saturday the 26th May. There isn't any entry fee to the Powerhouse Museum if you are coming to the talk. Guild members pay $5 and non-guild members $15 to attend. The next General Meeting will be held on Saturday 19 May in the "Dome" on the 1st level at Burwood RSL. Also, lucky door prizes and Block of the Quarter. Bring your Signature Blocks (for the 30th Anniversary signature coverlet) and any "Pearls of Wisdom" for a future guild publication. Come and share the fun!..... Visitors most welcome. Our 30's glamour ensures that we're winners"
Just a reminder that if you are coming to the 30th Anniversary Dinner, there will be Prizes awarded to attendees displaying a unique use of Pearls! Once again the Arcadian Quilters' are exhibiting their creativity and hard work. Their Quilt Show will be on for 3 days next weekend ... at a very pleasant location. Worth taking Mum for Mother's Day! Tea, coffee and other refreshments available to enjoy whilst relaxing with friends. Quilts, Arts and Crafts for sale. 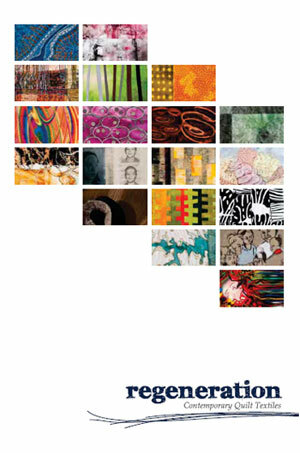 If you can’t make it to the Regeneration: Contemporary Quilt Textiles 2012 exhibition at Manly Art Gallery, you may like to download a copy of the Regeneration Catalogue (15.65MB PDF). This is an attractive, multi-page brochure on high quality paper. In addition to the curator's statement, the catalogue displays a full image of each work and associated artist statement.